Patios are the all-important link between a home and the garden that surrounds it. Whether they are adjacent to the house or off in the backyard somewhere, they make it easy to enjoy an outdoor lifestyle. The design should be a reflection of your personal style, your functional needs for the patio, and the character of the surrounding landscape elements. Formal landscapes call for formal patio designs. These are characterized by symmetry, plenty of open space, and traditional furnishings. 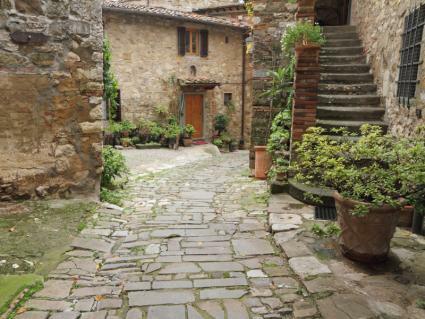 If the surface is stone, the flagstones should be cut square and laid like tiles, rather than organically-shaped pieces. If concrete is used, it can be stamped in a tile-like pattern. 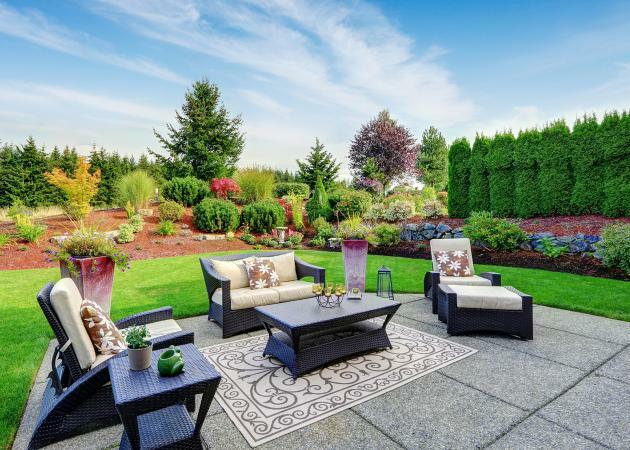 The views from the patio should be planned towards focal points in the landscape, such as a fountain, statuary, or perhaps just a flowering tree. 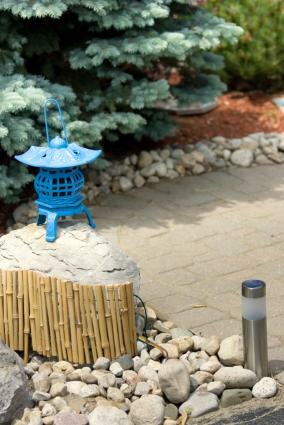 These focal points can also be incorporated into the patio area as long as they don't clutter the space. The spaciousness of a formal patio makes it the perfect for hosting social events, so it's important to add some furniture for everyone to relax in as they enjoy themselves. To achieve a formal aesthetic in a patio, avoid having vegetation overflow from beds onto the patio surface. 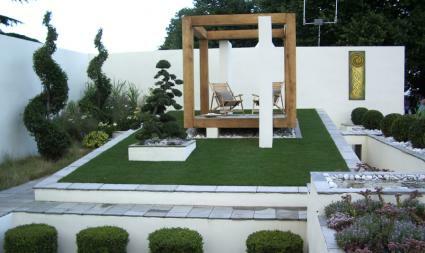 Surrounding the space with a lawn or formally-sheared shrubbery offers a simple way to maintain a clean aesthetic. Placing a concrete lip between any flower beds and the patio surface offers a great way to keep the soil, mulch, and vegetation form spilling onto the patio surface. 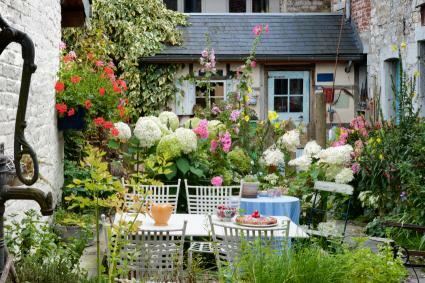 A cottage garden patio is almost the polar opposite of a formal one. Plants should be placed everywhere, spilling onto the patio surface and softening any straight lines or hard edges. In a formal patio, color is used sparingly and in an organized fashion, while a cottage patio typically includes flowers in every color of the rainbow intermingled in a spontaneous design. Cottage garden patios are casual. Flagstone is typically used as the surface material, but it can be laid in a random, jigsaw-puzzle form to take advantage of the natural variation in shape. Consider adding vertical features, like bird feeders, trellises, a pergola, hanging baskets, and wall-mounted planters. Use wooden planters and rustic accessories to make a quirky, colorful design. Cottage gardens are a place for interaction with nature, such as growing vegetables, harvesting flowers, etc. The patio can double as a workspace with a potting bench and outdoor sink for sowing seeds, making bouquets, and potting plants. It's a great place for outdoor projects with kids. A Tuscan patio is like a Mediterranean version of a cottage patio, although it's usually more spacious and can benefit from a slightly more formal approach to design, such as the use of symmetry. Mexican tile, with its warm colors and slightly uneven form, is a good choice for the patio surface, although flagstone is often used as well. A vine-covered pergola or a large overhanging tree can be used for shade. Aromatic herbs, grape vines, and fig or olive trees are commonly incorporated into a Tuscan patio design, as well as a large wooden table for enjoying wine and lengthy meals. Fresh, quality food is central in the lifestyle associated with Tuscan-themed design. Terra cotta urns and planters add a perfect touch to create the Tuscan ambiance. It's fine if they're a bit chipped or worn because that's part of the charm. 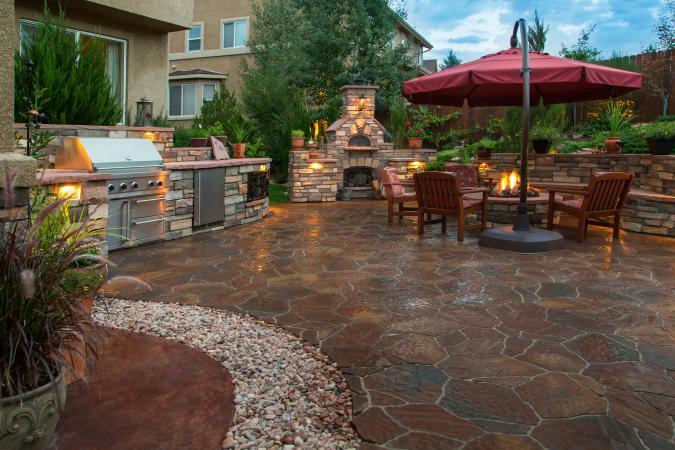 Overall, a Tuscan-inspired patio has a warm, well-worn and relaxed feel to it. Modernist design incorporates the clean lines and spaciousness of the formal approach, but it's completely unconstrained by any traditional form. Modern design tends to be quirky and creative, but it does not delve into the chaos of color and vegetation that grows every which way like a cottage patio. Smooth, polished concrete is the perfect surface for the modernist aesthetic. Designers typically decorate this space with slender, tapered planters filled with foliage plants instead of flowers. Placing smooth pebble mulch in planters and around the edges of the patio also enhances the sleek, refined aesthetic. Zen is an Asian-inspired aesthetic and takes a minimalist approach to design. Applied to a patio garden, the result is likely to be modest in size, sparsely furnished, and muted in the use of color. Like a formal patio, clean edges are important, yet symmetry is not a defining feature of a Zen-themed patio. These design approaches are merely a starting point to creating a patio that works for you. The differences between them are not hard and fast, and a successful patio design may well integrate elements from several different styles. Try playing with the ideas on paper first to help you visualize how they will best fit with the existing conditions of your property. After you have an idea of what you want, talk to a reputable contractor about making your vision a reality.